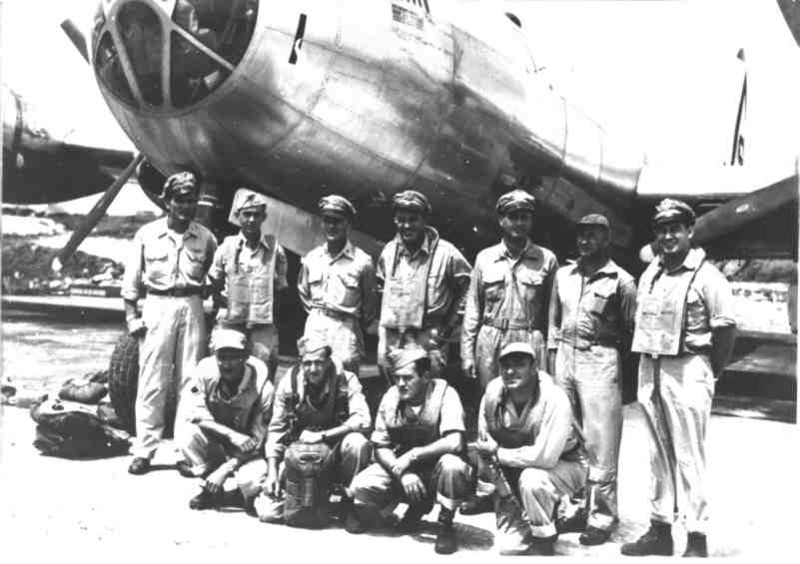 General LeMay's crew, Tinian, Sept. 13, 1945. Standing Left to Right: Capt. William W. Townes, Navigator, 45th. B.S., 1st.Lt. Stephen T. Jones, Navigator, 25th. B.S., Major John F. Wedding, Pilot, 468th. B. G., Lt Col. William C. Kingsbury, Pilot, 25th. B. S. , Capt. Theodore R. Finder, Flt. Eng., 40th. B. G. Hdq., 1st. Lt. John C. Eiland, Flt. Eng. 44th. B. S., lst. Lt. James I. Potts, Jr., Pilot, 25th B. S. Kneeling L. to R: S/Sgt. Frank Klas, Jr., Radio Operator, 44th. B. S., Sgt. Jerome A. School, Radio Operator, 25th. B. S., Sgt. Richard P. Fisher, Scanner, 25th. B. S., Sgt. B. T. Freeman, Scanner, 25th. B. S. Sgts. Fisher and Freeman were taken off the crew at Guam when Gen. LeMay and Col. Blanchard joined the crew. Master/S gt. Henry J. Rutowski, Crew Chief, was also a member of the crew.